The iconic car chase from Bullitt is often hailed as the greatest of all time, and for good reason. In this hugely influential scene, Steve McQueen’s hard-boiled Lt. Frank Bullitt essentially has to chase down a pair of hitmen in his Mustang. This simple setup leads to a lengthy car chase that sees them speeding down the hills of San Francisco before ending in a fiery crash at a highway service station. The chase is brilliantly shot, with first-person perspectives from inside the cars making for some genuinely scary moments. Additionally, the rhythm of the editing is near flawless. These things combined with some amazing stunt driving make for a car chase that holds up as one of the greatest, more than 40 years after the film’s release. Ten years after Bullitt, another incredible car chase was committed to film for Walter Hill’s The Driver. The film opens with the exhilarating pursuit, in which we follow the titular character as he tries to escape the police. We learn the only thing that will really matter in relation to the protagonist: he is a hugely capable escape driver. Like much of the film, the chase takes place in the beautifully shot streets of LA at night time, which adds to the visual delight. The editing also plays a vital role in this sequence, as the long and quiet shots of the chase contrast violently with the close ups of loud, screeching tyres. While many movie car chases are accused of being excessive or over the top, this is certainly not the case with this scene from Edgar Wright’s Hot Fuzz. Throughout the film – part cop-movie parody/part celebration – the exaggerated and romanticised nature of police work in movies is constantly shot down, with things like the abundance of paperwork are heavily focused on. In this ‘car chase’, Nicholas Angel and his partner Danny have to pull over a speeding car. This could be the setup to any number of typical police chase set pieces, but here the process is hilariously short and anti-climactic, as the speeding car more or less pulls over immediately. A chase on foot can often be just as exhilarating as one in a car. Kathryn Bigelow’s action-thriller, Point Break is an silly film, but it is also an extremely fun film, filled with many fantastic action set pieces. Perhaps the best of these set pieces arrives when the brilliantly named central character, Johnny Utah, must run down the bank robber who also happens to be his recently made surfing friend. The chase takes them through houses and backyards before it ends with Johnny essentially letting the robber escape. While often mocked – most notably in the previously listed film, Hot Fuzz (“you ever fired your gun up in the air and gone ‘agh’?”) – this on foot chase is a brilliantly executed sequence. Another on foot chase sees Nicholas Cage’s H.I attempting to escape the police after stealing a box of nappies. Like most of Raising Arizona, this scene is brilliant in its absurdity, as police immediately begin shooting at H.I, all while the hilarious theme plays over the top. H.I is eventually able to commandeer a passing car, prolonging the chase before it ends with him flying through the car windscreen. While it may not be as exhilarating or adrenaline pumping as some other chases, it more than makes up for that with its hilariousness. In Steven Spielberg’s science-fiction masterpiece, the vehicle of choice is a bicycle. In this iconic scene, Elliott and his friends must help their alien friend, E.T, escape to safety. Using the mobility of their bikes and their knowledge of the streets, the kids are able to evade the government vans until a blocked off road eventually traps them, with E.T’s powers now being their only hope. Everything from the music, the editing, and of course the climactic moment that sees the bikes take off into the sky against the setting sun in the background, make this sequence extremely deserving of the label it is so often given: magical. Like The Driver, a chase is also used as a means of world-building in the opening scene of Akira. The scene sees two gangs in Post-World War Three Neo-Tokyo square off against each other on their motorcycles. As they speed through to dystopian streets, we are able to get a sense of the world and the characters with little actual description of either. The chase builds to a one on one game of chicken, as two characters hurl towards each other finishing with the main character, Kaneda’s famous slide to a stop. While it doesn’t have the stunt work of a film like Bullitt going for it, the beautiful and slick animation of Akira makes this chase something special. From future Japan to 50s America, this sequence from Robert Zemeckis near-perfect time travel film involves Marty McFly fleeing his father’s childhood bully, Biff. The chase begins with the invention of the skateboard, as Marty breaks the scooter-like toy of a passing child. Biff and his friends then proceed to pursue Marty in their car, making for a seemingly uneven match, but Marty is able to outplay them with his final move, running over the top of their car leaving them to crash into the back of a hay truck. Clever stunt work like this, along with the triumphant score and the hilarious cuts to Marty’s mother gushing over him and labelling him ‘an absolute dream’, make this an extremely fun skateboard/car chase. The chase sequence early on in Terminator 2 makes clear that this sequel will essentially be like the original but much, much bigger. John Connor, on his dirt bike, must flee the T-1000, while his ally, Arnold Schwarzenegger’s Terminator, attempts to catch up. There are plenty of things that make this scene so amazing, including the rhythmic editing and the outrageous stunt work that involves things like a truck crashing off a bridge, but it is the idea of being pursued by a relentless and seemingly invincible force that make it, as well as the entire film, such a gripping thing to watch. 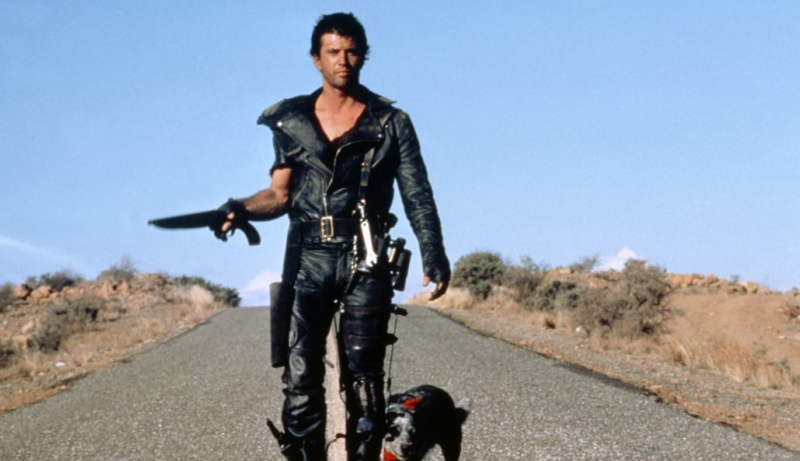 Like Terminator 2, the sequel to 1979’s Mad Max built heavily on its predecessor. In Mad Max 2, both the post-apocalyptic wasteland and the titular character have gotten even further away from any memory of society. Having agreed to help a small community escape a group of bandits, the film’s climax sees Max fleeing the bandits in a heavily armoured tanker. The sequence stretches out to around twenty minutes, and is beautifully over the top in every way, from the fantastically crazy costumes and re-tooled cars, to the unbelievable stunt work that the series has become known for.